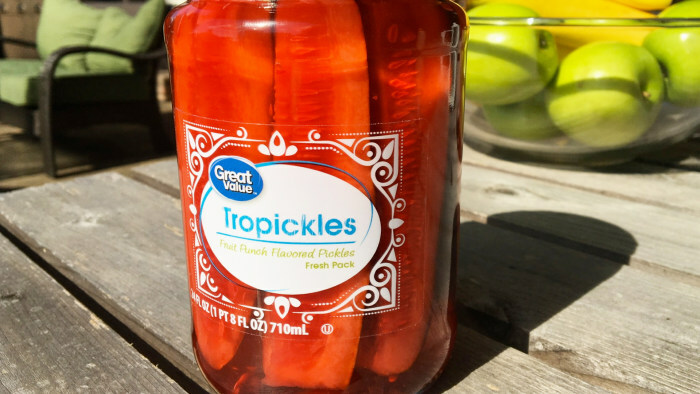 TODAY.com – The latest wacky pickle product is something Walmart is calling “Tropickles,” a summer release featuring cucumber pickles floating in a jar of red fruit punch. The pickles, which were released July 14, are now being sold under the discount retailer’s Great Value brand. I love trying outrageous new food and beverage products. I’ve yet to find a new Oreo flavor that I can’t eat a whole sleeve of in one sitting. I admire Taco Bell for its tireless efforts in innovation and for bringing new and creative products to life, like the Doritos Locos Tacos. I’ve enjoyed a few Not Your Father’s Root Beers, and know that Dougie can’t wait to get his hands on some Not Your Father’s Mountain Ale. I love it when companies and restaurants take chances. But fruit punch flavored pickles is where I draw the line. Who the hell thought cucumbers in fruit punch flavored vinegar would be a good idea? I’m serious. I can’t think of one reason to try a Tropickle other than just to see how disgusting it is. Maybe I’ll pick up a jar and save it until December and make the guy who finishes in last place in my fantasy football league down it. It can’t be much better than pumpkin spice motor oil. So while I’m washing down a McLobster with a Moxie this weekend, I’ll take a pass on Tropickles. This entry was posted in Food, General and tagged Tropickles, Walmart. Bookmark the permalink.